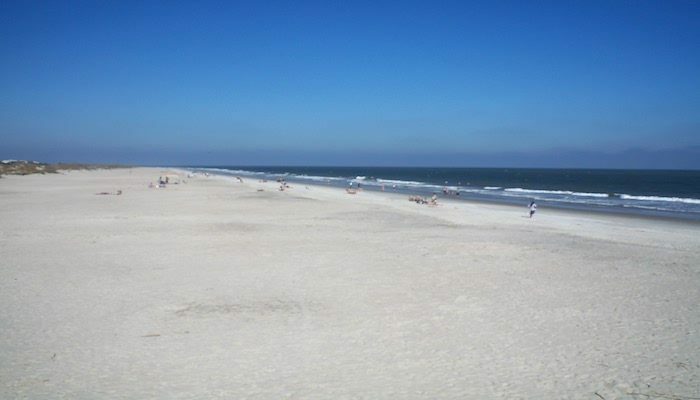 Tybee Island is a barrier island near Savannah. It’s the best spot for a beach run in the area. A highlight of Tybee Island is to head out the lighthouse, which is the largest one in Georgia. There best spot for a run on Tybee is along the beach, which runs for nearly 6 continuous miles from North Beach near the lighthouse to Back Beach, near the tip of the island. Tybee Beach meets our “great beach for a run” criteria: long, flat, continuous, and with packed sand near the water most times of the day. The North Beach parking lot is near the lighthouse, next to Railwood Ave. It’s 1.3 miles to Mid Beach, at 8th St., and 2.4 miles to the end of South Beach at 18th St., where there’s the Tybee Island Fishing Pier. One can continue another 0.6 miles or so along Back Beach to the Fishing Pier off Chatham Ave. The Tybee Beach Pier & Pavillion is at 16th St. If you’d prefer a paved surface, we recommend the western part of Tybee, along Chatham Ave., which runs nearly a mile. The main road, Rt. 80/Butler Ave. in Tybee, is fairly busy and commercial, and lacks water views. 3 miles from North Beach to the Fishing Pier off Chatham Ave.